Like registered nurses, licensed practical nurses in Alabama can expect to see an increase in job opportunities in the coming years. This is primarily due to an aging population, which leads to two things: first, older patients will need more care as they suffer from illnesses and injuries associated with getting old; and second, a significant portion of current practicing nurses will leave the workforce due to retirement. In fact, the U.S. Department of Health and Human Services predicts that the state will not have enough skilled LPNs to keep up with patient and industry demands – Alabama is projected to have a shortfall of 700 licensed practical nurses by 2025. This suggests there will be many promising opportunities for aspiring LPNs looking for work in the state of Alabama. If you are considering this healthcare profession, start preparing for your career by reading about LPN programs in Alabama, the practical nursing field, and required steps for state licensure in this comprehensive guide. Those who are interested in becoming a licensed practical nurse can find several options for obtaining a diploma, certificate, or associate degree in Alabama. From two-year colleges such as Alabama Southern Community College and Northeast Alabama Community College, to technical schools such as Reid State Technical College, aspiring practical nurses can find a state-approved LPN program that meets their educational and financial needs. Prospective students can use the search tool below to browse LPN programs in Alabama and compare options to find the program that best fits their unique preferences. In order to take advantage of the growing nursing job opportunities around Alabama, practical nurses must go through the licensing process. While all states require nurses to obtain a license in order to legally work, Alabama has its own unique steps. This section outlines the licensing process in the state, as well as how practical nurses can keep their credentials current. Applicants must complete an accredited practical nursing program (either a diploma/certificate or an associate degree) that has been approved by the state. For LPNs seeking licensure by endorsement, the practical nursing program must meet the same educational criteria as Alabama’s nursing education programs. Alabama LPNs are required to renew their licenses every other year between September 1 and November 30. In order to be eligible for renewal, practical nurses must complete at least 24 contact hours of continuing education. In addition, they must pay a $78.50 fee ($75.00 renewal fee plus $3.50 transaction fee), provide proof of US citizenship, and pay any outstanding fees or fines. Practical nurses who do not renew their licenses by November 30 will be charged an additional $125 late fee. Those who do not renew by December 31 are required to go through the reinstatement process, which entails completing a reinstatement application and paying a required $225 fee. Although licensed practical nurses in Alabama make a good living and can expect to see job growth, annual salary depends on where these professionals work. Take a look at the more granular salary details for Alabama LPNs. Much like salary, employment opportunities for practical nurses in Alabama can vary depending on the specific city, county, or metropolitan area. Not surprisingly, larger cities tend to employ more LPNs than smaller areas. 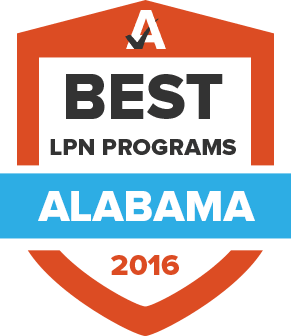 Use the map to find out more about the top locations for Alabama licensed practical nurses. The Alabama Association of Nurse Anesthetists is the state chapter of the American Association of Nurse Anesthetists. The organization provides news about the field for its members, as well as information for students. Nursing students in Alabama can receive support through the Alabama Association of Nursing Students, which is the state’s chapter of the National Student Nurses Association. Members can participate in the annual convention and receive discounts on books and NCLEX study materials. The Alabama Association of School Nurses has been representing the needs of Alabama’s school nurses since 1970. The organization provides continuing education and awards for excellence in nursing. The Alabama Board of Nursing is responsible for issuing licenses to LPNs around the state. The agency also ensures that nurses adhere to applicable state laws by reprimanding those who do not follow these professional standards. As the state’s chapter of the Emergency Nurses Association, this organization provides job listings, education opportunities, and access to the latest research that affects the field. This organization, which was founded in 1946, provides services to licensed practical nurses in the state, including annual events. Members of the Alabama State Nurses Association can participate in professional events and take continuing education courses through the organization. In addition, the association provides advocacy services to protect the interests of nurses around the state. Compiled by the Alabama Board of Nursing, this list details schools that provide LPN programs approved by the state. In addition, students can get an idea of how effective each program is at training nurses by reviewing schools’ NCLEX pass rates. Advanced practice nurses in the state can receive continuing education, job listings, and news about the field through the Central Alabama Nurse Practitioner Association. There are also professional events that members can attend. This report includes statistics about Alabama’s continuing education programs. The information was compiled by the Alabama Board of Nursing.